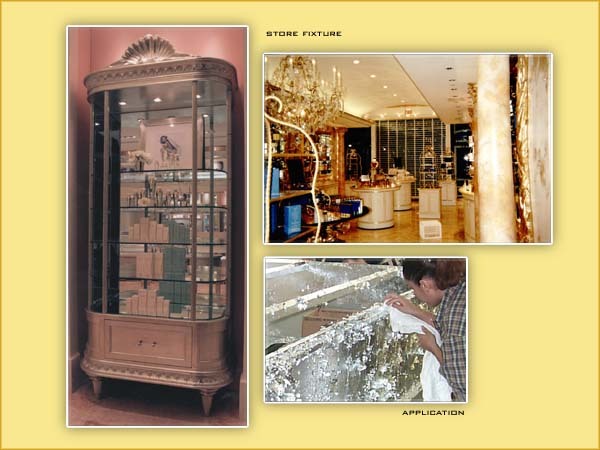 Since 1993, The Gold Shop, at Kelly Sign Company been supplying the store fixture industry with decorative leaf finishes. Operating within our sign shop facility, the Gold Shop prides itself on producing quality finishes from Dutch metal leaf to 23kt gold. We operate in large or small volume production runs. From trim molding to display tables and frames to cabinets, our gilders are capable of handling each project from sample to full-scale production. A key to our success in leaf finishes has been our ability to take a relatively inexpensive leaf (such as aluminum) and, through a toning process, transfer that otherwise common leaf into a unique, rich and expensive looking finish. Coupled with our ability to tone leaf, we are able to offer a wide array of striking finishes that will put and keep you a step ahead of your competitors. Considering literally, the miles of leaf that we have applied, you'll recognize that there is no substitute for experience. With firm commitment to quality and a keen knowledge of time constraints in the store fixture industry, The Gold Shop at Kelly Sign Company is a must know for your design and purchasing departments.